in October & November 2010. Limited number of East Coast shows only. current international reggae scene, Groundation is touring their highly acclaimed sixth album, Here I Am. showcase spot at the 2010 Australasian World Music Expo in Melbourne. Band leader Harrison Stafford says the band is excited about their foray onto Australian shores. of the best reggae music has to offer with perpetually fresh jazz-inspired improvisation. I wonder who the Selector will be??? 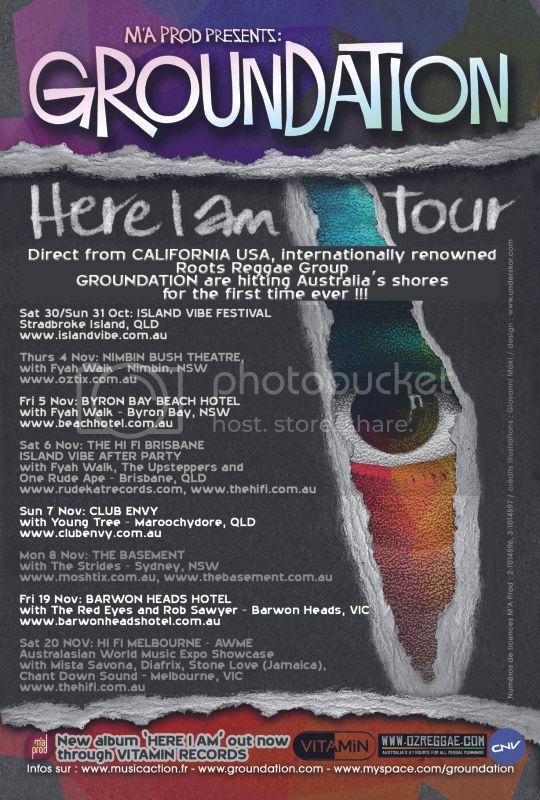 This November sees original nine-piece U.S. reggae band, Groundation reach Australian shores for the first time as part of their ‘Here I Am’ world tour. We have 2 single passes to give away to each show around the country. To win, email us at info (at) ozreggae.com with your details. You must be an OzReggae member to enter the competition. Please see below which town is closest to you.